Apparently you cannot put trust and love in a spreadsheet. According to a number of people who attended SXSW’s panel on ROI for Social Media, this makes tracking the return on investment of Social Media for business impossible. During the panel the #SXSMROI Twitter stream was full of comments following this theme. Many commented that Social Media’s value for business shouldn’t be measured in terms of money, either the loss, saving or acquisition thereof. The most surprising thing about the sentiment expressed during the panel showed how little the attitude towards Social Media has changed within business. Much of the visible discussion about ROI for Social Media is focused on arbitrary “value of a fan” figures, engagement, conversation and raw fan, like, retweet and follower metrics. Revenue and cost rarely get discussed. 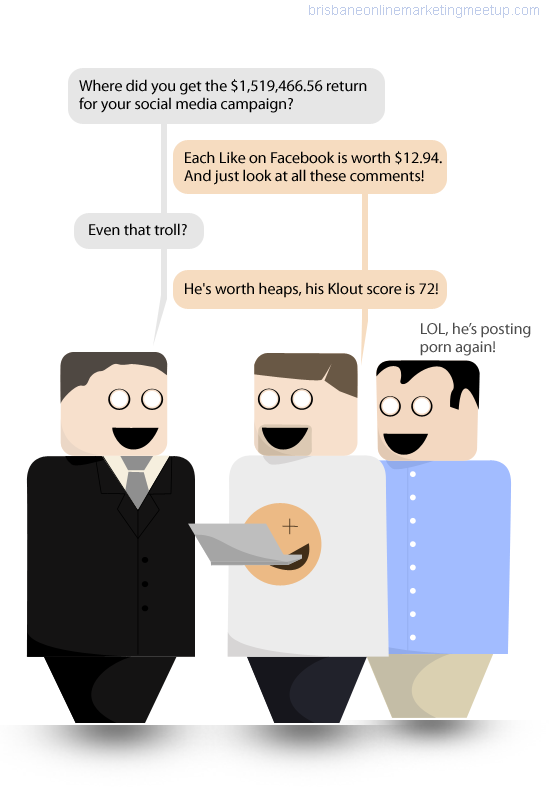 What is the ROI of Trolls? Return on Investment is actually a very straightforward concept. An old textbook from university defines it as “a ratio of required costs and perceived benefits of a project or an application” (King, Lee & Viehland, 2004 p. 569). At its simplest you measure what goes into a project or business process, be it cash, time spent by employees and other resources, and compare that to what the business gets out of it. It is practically gamification, where businesses keep score on what what is working and what is not by the numbers in the bottom line. It is a witty statement and fits into Twitter’s 140 character limit. It is also wrong. You can find the ROI of a telephone, or a pencil for that matter. Service and technology companies such as Intel (PDF) think so. Aside from the savings of switching to a VoIP system, Intel’s case study also outlined another business benefit for adopting their systems: productivity gains. The return on a project is not always in creating a new revenue stream. The worst part of the analogy quoted above is that practically every piece of technology in common use now at some point had to be shown to have value. From the phone, to mainframe computers, desktop machines, mobiles and the Internet. Business systems often provide more benefits to the bottom line than just directly generating revenue or cutting costs. In many cases it is how these tools create efficiencies internally or assist in acquiring and serving customers that creates the return for the business. There are two things fundamental to running a business and ROI; revenue and expenditure. Most organisations attempt to link expenditure to a source of revenue, either directly such as in the case of marketing, or indirectly in the case of business functions such as customer service and HR. The one simple, inescapable fact at the centre of this discussion is that Social Media projects cost money. Either as cash for supporting marketing, tools and external experts, or the money spent on the wages of those involved with posting content, creating cat-themed memes and responding to customers. It is important that posting cat photos and building love and trust contributes to the business’ bottom line. Knowing what works for the business makes it possible to decide if the marketing department should spend their time drafting tweets or creating another eDM. It means knowing if customer service staff should stick to the phones, or be trained to respond to questions on Facebook. Pouring money and resources into projects with no return is not a sustainable practice, no matter how many Twitter followers a brand might gain or the number of happy Facebook fans who have won an iPad. Tools like Google’s Social Reports in Analytics and Assisted Conversion funnels do make it easier to track the effect of a Social Media campaign on online activity and sales even if they don’t reveal much about other channels. However measuring the return on engaging in Social Media for business is not limited to last click attribution and cross channel sales tracking. Social Media is more than just another marketing channel. Because of the nature of the platforms, an organisation’s Social Media spaces will inevitably be used by the community as they see fit. Social Media sites such as Pinterest and Facebook have more in common with shared public spaces than dedicated media channels. One of the more common ways an organisation’s audience appropriate these spaces is to expedite customer service and to make general enquiries. In fact a number of very successful Social Media initiatives have taken advantage of this behaviour, such as Dell with @DellCares. Because of the ease of disseminating information and the access they can give to a pre-existing audience, Social Media is a natural fit for Business Communication and a powerful way to serve customers directly. These functions often do not directly generate revenue but they still create value for the business. For example, while I was with Greyhound Australia the brand’s Facebook page was often used to respond to product questions and customer service enquiries, in addition to normal promotional activity. By responding to questions in public in a shared space the brand was able to communicate with the person who ask as well as others with the same question. Under normal circumstances using online spaces to address customer queries helped to improve customer service in general, it was during extraordinary events where it created the most value. During the Queensland floods Greyhound’s online spaces, including Facebook, were important for keeping customers informed, and managing direct customer enquiries. It made it possible to communicate with customers directly and en masse. Using online tools such as the company’s website and Social Media spaces made it easier for customers to find the information they needed to be aware of changes to services and manage the load experienced in other customer service channels. While this is an extreme example, it was an expansion of existing practices in response to an extraordinary situation. Facebook was already used as a communications and customer service channel as well as a marketing tool, and the return on the time and resources invested were measured as such. Social Media projects for business will be treated like any other. Goals will be set, processes put in place and KPIs assigned. Until someone discovers a way to pay for servers with love and trust, some form of economic benefit will be expected, which in turn will be weighed against the costs associated with the project. The idea that Social Media is different really should be dead and buried by now. Developing and managing online communities takes effort, and in a commercial setting, this costs money. Likes and retweets don’t pay bills, and at some point, people need to get paid. King, D, Lee, J & Viehland, D 2004. Electric Commerce; A Managerial Perspective, Pearson Education, Upper Saddle River, New Jersey.